Contemporary dinosaur palaeontologists, like Steve Brusatte in his The Rise and Fall of the Dinosaurs (2018), have been keen to stress that the dinosaurs were diverse and spectacular evolutionary successes (whose ancestors survive today). This point requires significant stressing, because dinosaurs have long signified failure. In the acrid visual language of political cartoons, dinosaurs usually represent the worst accusations cartoonists can think of (Figure 1). Falling down the Google Images rabbit-hole we encounter recent political dinosaurs, most of them American, standing in for the Republican Party, the mainstream media, NATO, Brexit, recessions, the coal industry, climate change deniers, Wall Street, bureaucracy, and the national debt, in addition to many, many dinosaurs which have been retrofitted with the head of Donald Trump. You call something a dinosaur when you think it’s on the wrong side of history or living on borrowed time; when it’s unmanageable, short-sighted, old-fashioned, self-destructive, unsustainably ravenous, distinctly unsuccessful. At least, you do if you’re a political cartoonist. In recent decades, the dinosaurs of political cartoons have sometimes been depicted as sufferers of asteroidal bad luck, but the political dinosaur is usually its own worst enemy and/or the enemy of progress. Figure 1. Here, famed cartoonist Winsor McCay depicts the ‘Dinosaur’ alongside other outdated animals, objects, and institutions supposedly swept away by the progress of ‘Time’, including ‘The Rack’ and ‘Slavery’. Winsor McCay, ‘Oblivion’s Cave—Step Right In, Please’, Sunday American, 19 March 1922. At PopPalaeo, we have often interrogated narratives, like ‘progress’, which are used to shape and frame palaeontology. At the December 2018 session, for instance, Elsa Panciroli looked at how non-specialists and even specialists have tended to view the idea of evolutionary success in loose or colloquial ways. These perspectives have usually been detrimental to the idea that the small Mesozoic mammals that lived alongside dinosaurs were – despite often being the prey of those dinosaurs – diverse, abundant, and successful. Mark Witton, moreover, spoke about the tendency of so many artists to ‘monsterise’ extinct animals, turning the denizens of prehistory from credible animals into improbable killing machines. Compared to these nightmare fiends, modern nature looks positively reformed by comparison. Both speakers were, to a significant degree, looking at how and why we turn prehistoric animals into goodies and baddies, winners and losers—progressive and conservative. Throughout history, dinosaurs have typically represented unprogressive moral qualities. The dinosaurs’ dart-board-like role in mediating political disagreements today is steeped in late nineteenth- and early twentieth-century evolutionary science. When the most famous dinosaurs—Triceratops, Stegosaurus, Brontosaurus—were unearthed in the Gilded-Age United States, their incredibly tiny brains stood out in the face of evolutionary theories that emphasised continuous brain growth. Low intelligence, hardly a factor in the original classification of the dinosaurs by Richard Owen in 1842, became one of their most notorious characteristics (Figure 2). Figure 2. Triceratops in E. Ray Lankester’s children’s book, Extinct Animals (1905). Lankester, formerly Director of the London Natural History Museum, described the ‘incredibly small’ brain of this dinosaur compared to the size of its head, observing that ‘[v]ery probably this small size of the brain of great extinct animals has to do with the fact of their ceasing to exist.’ E. Ray Lankester, Extinct Animals (London: Constable, 1905), pp. 207, 209. Then again, we are familiar with the effects of old age in the individual; toothlessness, lack of energy and diminution of the sense, and it appears that a similar series of characters can, in fact, affect a whole group of animals. This is called phylogeronty, the old age of a phylum. The symptoms of this are gigantism, spinescence and loss of the teeth […] Taken together, these facts mean that old and tried stocks (exhausted perhaps by evolutionary activity) and those like the Ceratopisa that were very specialized were suddenly faced with changing environmental conditions that demanded new efforts from them at the very time they were unable to give them. Certain types of dinosaur were frequently assumed to have evolved in futile directions: namely the oversized sauropods, inexplicably spiny stegosaurus, and heavy-headed ceratopsians. Such views had been influential (although not universally accepted) in palaeontological circles throughout the first half of the twentieth century, even if they were, by the time of Swinton’s writing, becoming distinctly outmoded. Phylogeronty was also called ‘racial senility’ or ‘racial senescence’, in a common but telling slippage between early twentieth-century anthropological and palaeontological science. Palaeontologists and science writers revelled in the stupidity and inherent obsolescence of so many dinosaurs – slamming into Stegosaurus and Triceratops again and again. The moral implications a reader might take from Swinton’s words about the decadent dinosaurs are clear. The palaeontological writer Henry R. Knipe had put it even more plainly in his Evolution in the Past (1912), ‘the superior intelligence and higher moral qualities of the mammals’ were key reasons by which ‘the old reptile nobility, unable to march with the times, had been swept away’. Those familiar with the illustrated palaeontology books of the artist Charles R. Knight will recall his many tirades against the ‘stupid, unadaptable, and unprogressive dinosaurs’ and his fondness for the ‘little warm-blooded beings, furry, alert and aggressive’ who ‘were to supersede them’ (1946). In fiction, the threat presented by dinosaurs acted as a spur to energy against complacence and decadence. Predatory dinosaurs, not so commonly associated with phylogeronty, were potentially dangerous foes despite their tiny brains. In romances like the lost-world adventures of Edgar Rice Burroughs, fish-out-of-water male protagonists rediscover their masculinity while pitting their bodies and their wits against largely brainless and cumbersome but physically powerful dinosaurs. While contemporary palaeontologists might object to films like Jurassic World (2015) that depict predatory dinosaurs as scaly serial killers, early twentieth-century naturalists were less sympathetic to their subjects. When Arthur Conan Doyle made the dinosaurs in his romance The Lost World (1912) brainless killing machines, the famous naturalist E. Ray Lankester wrote to congratulate him on his accuracy: ‘I notice that you rightly withhold any intelligence from the big dinosaurs’. In specialist circles, the stark contrast between warm-blooded, far-sighted mammals and cold-blooded, idiotic dinosaurs would eventually be chipped away by suggestions that some dinosaurs were warm-blooded; subsequently, the theory that an unlucky encounter with an asteroid killed off most of the dinosaurs put paid to the idea that dinosaurs like Triceratops—objects of derision since the 1890s—were simply at the end of their tether. Memorable images of dinosaurs growing too large, spiny, and vicious for their own good, however, stay with us. It’s no surprise that dinosaurs continue to entice not only palaeontologists, but also cultural historians, historians of science, and literary scholars. The Mesozoic is a morality play. She looked through the open door and saw the jungle. She saw the jaws close upon her husband. She saw colossal, abstracted eyes half close as the something gulped, and partly choked, and swallowed – She saw a lump in the monstrous neck move from the relatively slender portion just behind the head to the feet-thick section projecting from the jungle. She saw the head withdraw into the jungle and instantly be lost to sight. We need not let the snake-like description of “the something”, nor its choice of meal, prevent us from realising that it is a sauropod, most probably Brontosaurus. Carnivorous brontosaurs had popped up before – there’s one in King Kong (1933) – and the repeated appearance of hostile, violent dinosaurs across the SF of the interwar period allows Leinster to introduce his dinosaur without using any of the proper nouns which his Ohioan characters would not have known. This is the solitary appearance of a dinosaur in Leinster’s story, which otherwise mixes together only distinctively human possibilities (for example, a reality in which the Chinese have colonised America). It reached my attention as yet another example of a dinosaur making a cameo at the beginning of a new genre of popular literature – a subject in which I’m much interested – but after this latest PopPalaeo, and in particular after Susannah Lydon’s brilliant paper on plant blindness, I hadn’t paid enough attention to the forest. “Carboniferous”: that’s about 143 million years before the first Brontosaurus, (very) roughly twice as long as ago from the present day. Yet Leinster isn’t using the technical term at random – he describes the forest as “the source of our coal beds”, as indeed the Carboniferous forests are. Huge, spreading tree ferns soared upward a hundred feet. Lacy, foliated branches formed a roof of incredible density above sheer jungle such as no man on earth had ever seen before. The jungles of the Amazon basin were parklike by comparison with its thickness. It was a riotous tangle of living vegetation in which growth was battle, and battle was life, and life was deadly, merciless conflict. Though the jungle itself never harms anyone – it is never seen again in the story – this language of implicit violence contrasts interestingly with the farmland which has been replaced. Particularly striking is that phrase “living vegetation”, which seems to imply a lack of vitality in our contemporary flora. These plants are somehow more alive than ours – and that’s bad. How has the Brontosaurus ended up in this anachronistic environment? The story is about time periods being jumbled up, although other details about the way in which the mixup has happened make it unlikely that the animal has just wandered into the past. Is it Leinster’s own illiteracy or laziness? Possible – this is pulp SF, and would likely have been written too quickly for robust fact-checking. My preferred explanation, though, is thematic: it makes instinctive sense to have this grand jungle to set the stage, just as it makes sense to have the largest known land animal along to eat somebody. Whatever the explanation, the incident forces me to confront my own plant blindness: I’d paid so much attention to the vague sauropod that I’d overlooked the jungle entirely. With my research emphasis on palaeontology, I’d failed to notice that it’s palaeobotany Leinster evokes by name. Like Sam Neill’s character at the moment of revelation in Jurassic Park, I ignored the massive botanical revolution and concentrated on the charismatic megafauna. More fool me. There are few arenas where Brontosaurus, ‘awesome-bro’ palaeoart, and Dutch missionaries are topical bedfellows. What could possibly unite the last British bear to Belgian Iguanodons, or move conversation smoothly between ‘plant blindness’ and Neanderthals? It can only be the fourth Popularising Palaeontology Workshop. Popularising Palaeontology, or PopPalaeo, was held in London just before Christmas. The purpose of the workshops - which have been running since 2016 - is to explore themes around palaeontology and its role in culture, such as depictions in art, film and literature. Attendees come from a truly multidisciplinary spectrum including historians, archaeologists, artists, scientists, journalists – and those who wear more than one of these hats at a time. I got so much from participating in the first workshop, I was excited to get stuck in to this latest event. The overarching theme for this workshop was Debates and Issues. On the first day, our opening session by Paul Brinkman was on the strong personalities of antagonistic palaeontologists in the late 1800s in the United States. This revolved around the famous squabbles between Edward Drinker Cope and Othniel Charles Marsh. Brinkman told us about Henry Fairfield Osborn collecting ‘Marshiana’: a term coined by his mentor Cope to describe the letters, notes and other evidence collected against Marsh. Quite quickly, Osbore realised “collecting data on the foibles of my rivals is a good move” said Brinkman. We wondered as a group about the role of unpleasant personalities in the history (and the present) of palaeontology, as Brinkman declared that Cope, Marsh and Osborn were, to be honest, all “massive jerks”. But would we still be talking about them if they weren’t? Hannah O’Regan explored how long wild bears persisted in the UK. She outlined the evidence from scant bones, and coupled this with our understanding of the survivability of isolated populations, calculated using a programme called VORTEX. The evidence suggests to her that bears probably died out by the early Bronze Age, and later reintroductions by the Romans explain the scattered bear bones found in later time periods, which are all from sites associated with humans. A line of support for this, is the lack of bears in old place-names. Wolves on the other hand, are incorporated into local names, and we know they persisted for much longer. This is an interesting example of the impact of the disappearance of animals on human culture and language. With this thought fresh in our minds, we heard about Lost Species Day from Matt Stanfield. Held on November the 30th each year, it is an opportunity to honour the many animals already extinct through human activity. Stanfield talked about the emotional, personal connection that people form with these lost creatures, particularly after creating artwork of them. The process of creation and desire for accuracy forces the artist to take a much closer look at these animals than many of us usually would. After coffee it was my turn to talk – and it will come as no surprise that Mesozoic mammals (#MesozoicMammals) were a strong thread throughout the presentation. But what I was really interested in discussing was how we still talk in outdated progressionist terms about evolution, despite our increasing scientific literacy. We also focus on the big, often carnivorous animals as examples of ‘advancement’ and ‘success’ in evolution - but what do we really mean by ‘success’? The term is problematic both in meaning and application, and rarely corresponds to the biological definition of the word. Despite the undoubted success of things like small mammals, herps and insects, we rarely ever discuss those groups in those terms. To round off the first day’s presentations, Hanneke Meijer told us the story of the ‘man who didn’t dig deep enough’; a Dutch missionary named Theodor Verhoeven who carried out excavations in Indonesia in the 1950-60s, including in the cave that in 2013 yielded the skull of the new species of hominin, Homo floresiensis (aka ‘Flores Man’ or ‘the Hobbit’). He discovered many bones and even published his findings, yet his legacy is considered a failure. We attach great value to the hominin discovery that we don’t give to other finds, however diligently collected or well-intentioned. This led to a fascinating discussion about how we assign value to some fossils over others, based on science, culture, and personal values. That evening there was a public event asking the question: ‘What is the point of palaeontology?’ Hoping that we wouldn’t be expected to have an answer (but we were), I joined colleagues Becky Wragg-Sykes, Darren Naish and Mark Witton on a panel with lively Q and A from the public. In an adjacent room, old and new palaeoart was on display, addressing themes such as historical depictions of extinct animals, and whether palaeoart is successful when following an art-first approach. But most crucially: there was also free wine, which made everyone very happy. From something under-represented in art and culture, to something people just can’t get enough of: Neanderthals. This lost branch of humanity not only lived alongside our own genus, Homo, but DNA shows us they are the ancestors of many of us. But as Becky Wragg-Sykes points out, the actual science of the Neanderthal is often overshadowed by the deep-seated fascination they hold for the public. They unfairly remain a cultural shorthand for the primitive and stupid. The media leaps on any new research about Neanderthals, and simultaneously perpetuates these old stereotypes. Wragg-Sykes took us through a wonderful series of palaeoartistic reconstructions, reflecting our changing understanding (and prejudices) about these hominins through time. She reflected that our fascination with them is like the fascination with aliens: Neanderthals are historically our first-contact with an alien being, a humanoid but not quite human, the ‘other’. For some time we tried not to mention the sauropod in the room, ‘that Spielberg Hollywood film’. Inevitably, Jurassic Park featured often in discussions, to many people’s chagrin. This also raised an interesting question: what is it about JP that means we always end up talking about it? It’s hard to deny that the film was a pivotal point, not only for the story of palaeontology and culture, but for palaeontologists and those who work in connection with that discipline. We only have to look at the level of enthusiastic gushing that took place among palaeontologists during the recent twenty-five year anniversary. Some of the participants at PopPalaeo argued we should try not to talk about it so much, believing its role in our discipline has been massively overplayed. The next two talks of the workshop were on ‘Dinosaurs and their uses’, and it was interesting to reflect that in two days of presentations, these were the first dedicated to that stereotype symbolic animal of palaeontology. In the first, Shana Van Hauwermeiren surprised us with the extensive role of Iguanadon in the history of Belgium in the 1800s and early 20th Century. “You could recreate the history of Belgium [at this time] using only articles that contain the word ‘Iguanodon’” she told us. They permeated politics, language, contemporary popular culture and science from this period. Yet, astonishingly, their role in Belgium’s past is virtually unknown in the country today. Will Tattersdill shifted our focus to the Brontosaurus: an animal that existed, then didn’t, then did again, as science changed its mind about its validity. He reflected on the sense of loss we feel for the dinosaurs of our childhood; science is changing them – adding feathers, altering posture and behaviour, bringing them to life then poofing them out again like candle flames. Each time we revisit our beloved childhood dinosaurs and find them gone, he argues, it is an experience analogous to a fresh ‘extinction’. In the final two talks we tackled the monstrous in palaeoart. First, the chimeric reconstructions made of synapsids, the line of animals that includes mammals. Ilya Nieuwland shared the attempts at interpreting ‘Naosaurus’ (now correctly identified and reconstructed as Edaphosaurus), a Permian animal related to Dimetrodon that also had ‘sail’ structure on its back formed from the extended spines of the vertebrae. We went from honest attempts to reconstruct animals that mistakenly made them monstrous, to deliberately making monsters by augmenting an animal’s ferocity beyond the data their fossils provide. Mark Witton polished off the talks by discussing the phenomenon of turning extinct animals into terrifying angry monsters – completely at odds with our understanding of real animals and their behaviour in the natural world. He shared three powerpoint slides depicting a furious toothy montage of T. rex and friends screaming from the cover of almost every book on dinosaurs and extinct animals on the shelves today. Why are we so obsessed with turning extinct creatures into monsters? Is it really about the animals, or more about the role of monsters in human culture? Witton’s talk brought us into lively discussion about what extinct animals mean to us. Why does it matter how they are depicted? As a scientist, my gut reaction is that accuracy matters. Certainly one of the most concerning reasons is that these depictions reflect the growing gaps in our understanding of the natural world, today and in the past. Fewer and fewer people know how animals behave in nature, and the roles they play in an integrated ecosystem. If dinosaurs are scary monsters, we can be glad they’re gone. This lessens the reality and impact of our current extinction crisis, because culturally the extinct is monstrous, and is therefore already unreal to us. We levelled the responsibility of helping change depictions of extinct animals at scientists and artists, recognising that trying to persuade advertisers and Hollywood to do it was a somewhat lost cause – or at least, approaching the problem from the wrong direction. While we can never remove all prehistoric ‘monsters’ – nor should we want to – we can make sure that there are plenty of images and information that depict extinct creatures and their habitats in an informed, scientifically up-to-date way, and that they are available to the public and media. As a scientist, I have access to one kind of ‘truth’ about the past. Although I place great value on it, it is not the only ‘truth’ that matters. The role of vanished animals in human culture is ingrained and multi-faceted. Fossil species will exist, and then cease, like the Brontosaurus. But one thing we know for sure is that their meaning to us as creatures of science, history, and popular culture, will never become extinct. Screenshot from Google Images search for Mary Anning. Mary Anning is a dinosaur. Not only an inhabitant of a former age, whose life and appearance we must reconstruct from surviving historical traces, but also a towering figure who dominates the popular palaeontological landscape. For my PopPalaeo talk I drew on this BSHS Viewpoint magazine piece, which surveyed the numerous historical and contemporary presentations of Anning’s life, particularly those intended for juvenile audiences. Whether starring in Kate Beaton’s witty cartoon reworking of Kelis, an online BBC educational resource and game, or a children’s science podcast on Dinosaur Poop Part 2, the multifaceted Anning, I showed, has appeared in various guises and for varied purposes over the past 200 years. As the subsequent discussion demonstrated (via many shared remembrances), the story of Mary Anning clearly remains a compelling entry-point into palaeontology and its histories, that very flexibility one reason for its continued success. Anning has been celebrated as a child discoverer, embodying the recurrent idea of the close connections between young people, nature, and curiosity; as a model observer, someone who can not only be admired but someone whose actions - and, perhaps, discoveries - can be mimicked; a Lyme Regis local, as firmly embedded in and associated with the Jurassic cliffs as any of her famous fossil specimens; an example of working-class engagement and negotiation with scientific authority and authorities; an expert whose specialist judgement and knowledge of palaeontological finds was sought out and valued; now, as an icon, Anning is a recurrent star of women in science lists, stage, and screen. However, for historians of science these stories are often unsatisfactory, reproducing heroic, individualised accounts of discovery and genius, particularly when distilled into works for children. A recurring theme of the conference was how evidently popular and already well-known aspects of palaeontology can be used as ‘gateways’ into more unfamiliar and complex material, unglamorous bryozoa or underwhelming fossil fish riding the coattails of charismatic megafauna. Can we - like the dinosaur - also use the popularity of Anning to introduce a wider perspective on what the history of palaeontology is and has been? New versions of Anning’s story, I suggested, could be told which might better reflect current approaches to histories of the sciences, highlighting Anning’s own place in a wider culture, other less celebrated figures, or those whose traces in the historical record do not survive. Moving beyond a heroic or a rags-to-not-quite-riches template for Anning’s story would not only enrich accounts and understandings of her palaeontological activities and their place in wider culture, but would also stress more firmly that stories about individuals always contain multitudes. One approach would be moving beyond individual biography to prospographies, using Anning as a entry-point to diverse communities of practitioners (as the excellent TrowelBlazers site reveals); another would be a questioning of the seeping hagiography which figures Anning as some sort of superhero, and instead presenting her as a flawed human being. Accounts could relocate the focus of their attention from people to objects, whether discovered specimens, relics, or places; or from the technical palaeontological content to a wider cultural history of seaside tourism and geological visiting, and much more. These are not novel thoughts: all these approaches have been and are being used in academic works, and to a certain extent in the more in-depth popular writings; but can it be done, too, in shorter or juvenile works? We have, I would argue, tended to brush off too much of the surrounding material when preparing Anning’s story for young audiences. Overall, the PopPalaeo discussed provoked valuable reflections on storytelling, the relationship between academic work and wider audiences, and on how traditional modes of biographical writing can be reworked or challenged in an attempt to introduce more complex cultural histories. So perhaps I should rephrase my opening line: necessarily living within a sea of wider connections and contexts, Mary Anning is – of course – a plesiosaur. Melanie Keene is Fellow and Graduate Tutor at Homerton College, Cambridge. She works on the history of science for children, and is the author of Science in Wonderland: the scientific fairy tales of Victorian Britain (OUP, 2015). Her current research projects are on science in juvenile periodicals, Noah’s Arks, and elementary anatomy. As a story, it has it all: a seaside setting, impoverished beginnings, a lightning strike, monstrous creatures, a tragic death, fame if not fortune, and even a little dog. No wonder numerous tales about nineteenth-century fossil-hunter Mary Anning have been told to rapt young audiences over the past one hundred and fifty years. During this time, different aspects of her story have been emphasised by children’s writers and illustrators: she has metamorphosed from a juvenile ‘Columbus’ of the ichthyosaur ‘fossil furies’ to a scatological ‘coprolite queen’ who should best be remembered for her expertise in ‘fossilized bits of poo’. Anning’s appealing life has evidently been an effective means to draw in new generations, introducing palaeontological research and discoveries through one of its favourite protagonists. This talk uses a range of representations of Anning’s life to explore the wider lessons these stories can teach us about ways to present the history of science to children. Some of us are intrinsically fascinated by fossils. We have been reciting dinosaur names, memorizing geologic timescales, and finding joy in natural history museums for as long as we can remember. I am absolutely one of those people. I was enchanted by fossils early, quickly—and without a single thought as to why. This captivation-from-birth phenomenon occasionally puts me at a disadvantage in communicating science. What, exactly, is it about the dusty old bones that I find so intriguing, I often wonder? The answer to this question sometimes difficult to articulate. Unlike some of my friends who are forced on a consistent basis to explain and defend why rat bones or bird fossils matter, I often fall back into my comfort zone of thinking my subject matter, the fossils of human ancestors, speaks for itself. But a fascination with fossils does not afflict the entire population equally, of course. Some people are excited by dusty old bones while others find joy in studying rockets ships, distant planets, or the depths of the ocean. I often wonder how I can best communicate with these audiences, those who are not intrinsically interested. If I struggle to article what first got me interested, how can I effectively communicate my passion to someone else? How can I (or we as a community) make palaeontology attractive to a range of audiences? What tools can we use to light the initial spark of enthusiasm? At the Popularizing Palaeontology workshop held in December 2017, this question of which strategies can help spark people’s interest came up. While I don’t know for sure, my guess is many of us gathered in that room suffer from this same disadvantage—we are those who have this innate fascination. We are not the majority. So how do overcome this to reach audiences of those who are not necessarily interested? A few ideas were put forward at the meeting. First and foremost, there is the power of the dinosaur as a window into prehistoric worlds. We know that dinosaurs capture peoples’ imaginations in powerful ways. But palaeontology is about so much more than massive, impressive extinct beasts like Tyrannosaurus rex, members of workshop complained. What about the fossils of ancient snails, trilobites, or pigeons, for example? These creatures also hold important knowledge about the past. Some science communicators use dinosaurs as gateway fossil of sorts, one that sparks an audience’s interest. Later, once the audience is paying attention, we try to show them that palaeolontology is so much more than Tyrannosaurus. But this second step is often difficult to accomplish. In my own work, which is focused on human evolution, I use a different strategy, often falling back on the power of a face. The stare from the hollow eyes of our ancestors—the Gibraltar Neanderthal, for example, or the scouring brow of a Homo erectus fossil—reveals a creature that exhibits both a glimmer of humanness and a distinct otherness. Sometimes this fossil gaze can catch peoples’ attention and light the initial spark. But his method is limited as well; we don’t always have the face of ancient fossils, and a Neanderthal face doesn’t get us any closer to communicating the importance of those important snails or pigeons. A different idea was brought up during the workshop, an alternative that struck me as a powerful tool: using the concept of deep time to spark peoples’ imaginations. This strategy moves away from the fossil itself, instead painting a picture of the deep, geologic timescale that has housed so many creatures and seen countless extinctions and massive evolutionary shifts. I find this approach fascinating, and it is one that I have never considered. Can something so foundational to our understanding of ancient life also be an important tool to communicate science? Deep time reminds us that there are so many lost worlds of strange creatures, that we are just a speck in the most recent point of time scale, that an enormous amount of time has passed before our potentially fleeting evolutionary moment as humans. For these reasons and many more, deep time seems to be a strategy to spark the fire that is worth pursuing. Visuals can help communicate the vastness of deep time, filling in the illustration where the numbers simply can’t. Upon exploring this topic further, it seems there have been many interesting art exhibits around the world that have focused on deep time. This is one of the values of having meetings like Popularizing Paleontology, with a mixture of scientists, artists, and historians. Those of us who are not visually creative stand to gain a tremendous amount by asking questions alongside artists. Metaphors, too, help paint a picture while reigning in the immensity of this stretch of time. As a result of the workshop, I am working on developing fun and interesting metaphors that plot human evolution on a more relatable time scale. Now of course, there are a series of precursory questions that are worth bearing in mind as consider this issue of which strategy is useful to get people excited about the prehistoric past. These questions include: “Should we? Why should we?” –And so on. These are much more difficult questions to answer, it seems to me. But they are important to keep in the back of a science communicator’s mind. For now, though, I am working on quieting that part of my brain that contemplates those issues in order to think more creatively about strategies to communicate the fascinating world of fossils to new and diverse audiences. One of the themes that came out of the second popularising palaeontology workshops was the democratic access to knowledge around palaeontology. 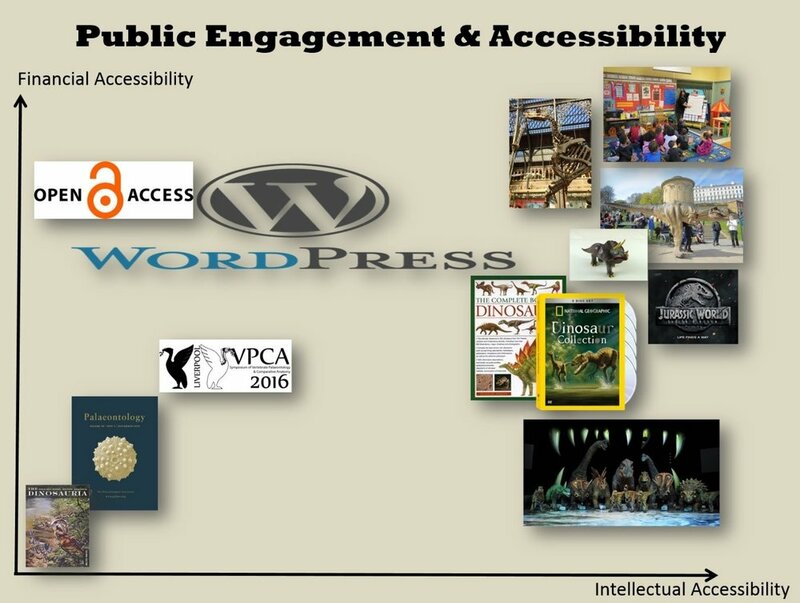 In my presentation ‘What has palaeontology ever done for us?’ I aimed to show that popularising palaeontology and making ideas accessible is laudably ingrained in the discipline. From schools outreach, museum displays and exhibitions, social media, fieldtrips for the public, fossil festivals, documentaries and popular science books many palaeontologists undertake these activities as part of their role, normally giving up a lot of their own time to do so. Popularising palaeontology is also part of the formal training for many palaeontology students, certainly in the UK, as evidenced by the enthusiastic undergraduates and postgraduate students communicating their work at fossil festivals and on social media. Many natural history museums were founded on the principals of sharing information for the common good, previously under the guise of ‘betterment’ (with a dash of social status boosting for founders of these early institutions) and today part of public engagement and public engagement with research. However, pursuing an interest in palaeontology is still a luxury activity for most. Visiting museums, picking up the latest popular book on dinosaurs or watching a documentary are all activities competing for people’s ‘free-time’. As a museum professional, I’m interested in trying to assess what information people bring with them. Where are the baselines for knowledge that can help us plan and pitch interpretation, tours, events and blog posts? Pitch it too high and you could end up baffling or alienating audiences (and it’s already a big challenge to get people through the doors of intimidating museum spaces). Pitch it too low and you miss the opportunity for transformational learning, although there is a debate about if engaging with museums should purely be for learning/education or not. That the public know anything about palaeontology in the first place, is in itself a testament to the success of a couple of centuries of popularising palaeontology. There’s very little that we can expect everyone coming through the doors of a museum to know when it comes to palaeontology. In the UK there’s not much in the national curriculum directly dealing with the subject and curriculum taught content at schools is a great equaliser in that, with exceptions, people of all classes and backgrounds are exposed to the same(ish) content. At GCSE and A-Level, students start to choose their own curriculum or leave school altogether. Of course there may be some who choose geology A-Levels or even pursue degrees in earth sciences but as a portion of the overall population this is a diminishing number of people. So where do people get access to palaeontological information beyond what they may learn at school and how can this inform how museums engage them with palaeontology? A bag of a fag-packet analysis might look at how readily available information is in terms of financial accessibility as well as intellectual accessibility. The idea behind the below figure I presented at the workshop. Of course, there are many more aspects to consider than these but in thinking about a baseline for the information people are likely to bring with them we can expect that more democratic sources of palaeontological information are more widely taken up. For example, it’s reasonable to assume that fewer people splash out on extremely expensive technical palaeontological texts costing hundreds of pounds than visit museums or go to the cinema to see Jurassic World. Plotting the financial and intellectual accessibility of palaeontological outputs. This is where we hit a tension that has been another major theme of the Popularising Palaeontology workshops, accuracy and authority of available palaeontological information. Jurassic World is famously, misrepresentative and inaccurate and obviously not intended as a palaeontological text, but as a piece of entertainment it requires the cost of a cinema ticket to access. Many palaeontologists are frustrated that such an impactful piece of media doesn’t take the extra care to get things right but then that’s the conflict between the goal of movie producers and the goal of science communicators. In any case, people do take the information they get from movies like Jurassic World and fold it into their general knowledge about palaeontology, hence questions like “Can we bring dinosaurs back from extinction?” that anyone who has staffed a stall at a fossil festival will undoubtedly have got. In the museum context, the nature of palaeontological specimens also presents issues unlike perhaps social history, art and archaeological collections. Irrespective of education, artifacts such as paintings, sculpture, ceramics or coins are more easily understood as human made objects. The panoply of palaeontological specimens are less intuitively understood from the casts or composites dinosaur skeletons through to the complex variety of different kinds of fossils. So we have very little assurances when it comes to the palaeontological information that the public bring with them into museum spaces. It’ll be a mix of information from children’s books, movies, documentaries, science reporting in the mainstream media, toys, games and maybe a Wikipedia article or two. This presents a significant challenge for public engagement in museums both in terms of the range of content that is covered as well as the level. Ideally we’d pair up each visitor with their own expert palaeontologist and science communicator who could react to questions and queries and run them around the museum offering bespoke tours and trails pitching the content precisely at the needs of the individuals. For obvious reasons, it’s the proxies of museum labels and interactives which do most of the heavy lifting when it comes to communicating science to the public which is precisely why there’s a perpetuating cycle of subjects and topics covered in museum displays. Most natural history museums will likely have a dinosaur, human evolution and perhaps ‘Ice Age mammals’ gallery or display. Few will give the same space and attention to archaeocyathans or mollusc evolution even when, on paper, there is a rich science behind all of them. It’s why displays called ‘These Are Not Dinosaurs’ highlighting pterosaurs, plesiosaurs and ichthyosaurs are still present (and needed) in museums as a direct response to the fuzzy public conflation of all these charismatic extinct animals. So how do we break the cycle or do we need to? Well fortunately, museums do have a lot of agency in steering this as intellectually and financially (more so in some parts of the world) accessible, trusted spaces with millions of visitors a year. With a bit of creativity we can employ some of the tools we use to push dinosaurs to shed light on other areas of palaeontology. Instead of buying another Stan or Sue, commission a life-size Cameroceras model or a diorama of an Ordovician reef. Smart technology also has a better part to play in museums than is currently being employed. I’d like to see displays that link through to relevant articles, papers and blog posts to give visitors the opportunity of exploring more and to kick start self-directed learning. We may not have enough expert guides for each and every visitor but livestreams, videos and podcasts are surely less of a compromise than static interpretation with a choice fact or two. By straying beyond the well-worn paths we’ll undoubtedly inspire film makers, scientists of the future, authors and museum visitors to explore these subjects more. This has happened a few times in the past. Virtually every natural history museum will have the same set of horse fossil casts on display which can be traced back to George Gaylord Simpson’s work on fossil horses. The same can also be said of Bernissart Iguanodon specimens, Archaeopteryx and the Oxford Dodo. Interestingly, all of these examples stem from museums sharing objects and casts of objects with each other. With 3D visualisation and printing so readily to hand these days, rather than retread the tropes of popular palaeontology we should be looking at creating palaeontological tropes of the future which, hopefully in turn ends up as part of the baseline public consciousness around palaeontology. Figure 1: J. A. Shepherd’s representation of the ‘Dinosaur Party’ in E. D. Cuming’s Wonders in Monsterland (1901). To explain why children love dinosaurs so much, biologist Stephen Jay Gould famously gave an answer ‘proposed by a psychologist colleague: “big, fierce, and extinct”’. The folksy wisdom of this nameless social scientist has been continually re-quoted ever since. But how can we historicise and contextualise the mythic appeal of bigness, fierceness, and extinctness? I wouldn’t say that dinosaurs have always been the elephant in the room at PopPalaeo workshops – for reasons that include a recently-acquired paranoia about mixed metaphors – but they do eat more than their fair share of the sandwiches. In the first workshop, Mark Witton suggested that, despite their formidable reputation, dinosaurs have chiefly been of interest to enthusiasts and children, and that, by over-relying on this group of animals, modern popularisers potentially miss out on other demographics. Considering similar issues, Elsa Panciroli and Mark Carnall explored how to interest wider audiences in less spectacular specimens. These key questions about audiences for palaeontology were integral to last year’s follow-up, PopPalaeo 2017. Different academic fields, however, require us to approach the same questions from different ends. While modern popularisers grapple with reaching out beyond one-dinosaur-fits-all approaches to popularisation, cultural historians can look back to a time when dinosaurs didn’t have such overwhelming powers of suggestion. Gould was fascinated by the often child-oriented ‘dinomania’ of the late-twentieth century. The Dinosaur Renaissance and its media are indeed crucial subjects of study, although historians of science have long recognised that parallels drawn between the era of Jurassic Park (1993) or The Land Before Time (1988) and the period when the word ‘dinosaur’ first gained cultural power can be superficial. For my part, I’d like to know much more about what dinosaurs meant to children (and the young at heart) before dinomania but after the well-known early- and mid-Victorian vogue for antediluvian saurians. Nowadays, the joke goes that children are more aware than their parents of what is or isn’t a dinosaur, and of how to pronounce polysyllabic names like Carcharodontosaurus. When did children’s authors (or at least those writing in English) start to trust that their young readers possessed this expertise? Before the American discoveries of the ‘Bone Wars’, the word ‘dinosaur’ was generally considered unimportant or relegated to a bashful footnote, even in books for adults and specialists. Dinosaurs only occasionally enjoyed prominence over their extinct confreres the pterodactyls, ichthyosaurs, mammoths, and megatheria. They were often drowned by lengthy discussions of geological processes that are more likely to be quickly dispensed with today. Around the turn of the twentieth century, when mounted and articulated dinosaur skeletons first started to populate museum galleries and shift copy, the word lumbered into the vernacular. Early popular writings that paid attention to dinosaurs for dinosaurs’ sake include John W. Dawson’s The Story of the Earth and Man (1873), Henry N. Hutchinson’s Extinct Monsters (1892) and Frederic A. Lucas’s Animals of the Past (1901). From this time on, the word seems to have lost its taboo status (although that’s not to imply it meant the same things that it means today). In E. D. Cuming’s Wonders in Monsterland (1901), young Jenny objects to the idea that dinosaur is a ‘hard’ word, to which her brother concedes “[t]hat’s an easy one” (p. 7). The cheerful title of Winsor McCay’s classic 1914 short film, Gertie the Dinosaur, attests to the word’s decreasing ‘hardness’. The earliest writers confident enough to use ‘dinosaur’ in general-interest book titles were two palaeontologists: W. D. Matthews of the American Museum of Natural History in Dinosaurs (1915) and W. E. Swinton of the London Natural History Museum in The Dinosaurs (1934). I suspect that to keep track of books called ‘Dinosaurs’ after the 1970s would be an exercise in futility. Undoubtedly, during the Long Gilded Age and for many decades thereafter, dinosaurs were accompanied in the popular imagination by the titanotheres, dinocerata, and ancestors of modern elephants and horses that have not enjoyed a late-twentieth-century Jurassic Park surge. All the same, there was a growing sense of distinctness. While it may be ahistorical to consider the Crystal Palace dinosaurs a manifestation of ‘dinomania’, the term is not quite so misleading when discussing the famous arrival of Diplodocus carnegii at the Natural History Museum in 1905 or the stop-motion effects of the 1925 film The Lost World. The concerns of interwar audiences can still be very alienating, however. During the adventures of Joc & Colette at the Natural History Museum by Vera Barclay (1935), the titular children spend only a few pages with the dinosaurs, but even their rather dense friend Jane knows that ‘some of those old dinosaurs who lived ages ago had another little brain’ in their tail (p. 135). My talk at the most recent PopPalaeo tentatively probed these questions by focusing on a small but telling phenomenon that I explore in my PhD: the entry of terms from the books of Lewis Carroll into the language used to describe extinct animals. This language was put to considerable use as a journalistic cliché, as when someone or something was flippantly dismissed as being ‘as extinct as the Mammoth or the Jabberwock’, but it was also applied more earnestly. When Richard Owen coined ‘Dinosauria’, the dinosaurs had all been similarly reptilian quadrupeds, although the word caught on only when it signified a far more heterogenous group, from kangaroo-birds to lizards with long necks or rhinoceros horns. For the earliest popularisers of these new dinosaurs, such as Henry Hutchinson, beasts like Carroll’s Jabberwock from Through the Looking-Glass (1871) presented an attractive analogy. 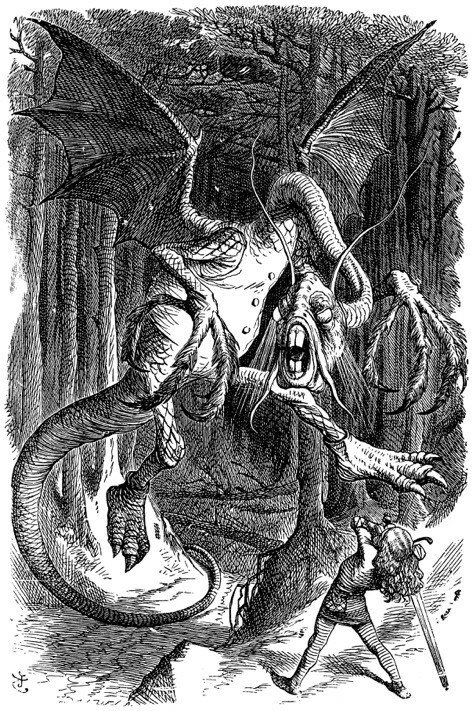 Figure 2: John Tenniel’s famous depiction of the Jabberwock in Lewis Carroll’s Through the Looking-Glass (1871). Despite his best efforts, many of Hutchinson’s readers found the illustrations of dinosaurs like Triceratops in his books to be almost as incredible and grotesque as the Jabberwock. As dinosaurs quickly became more familiar, Wonderland turned into a less volatile metaphor. It was used in sophisticated works of popularisation for children like Cuming’s Wonders in Monsterland and odd hybrids like E. O. Bray’s Old Time and the Boy or Prehistoric Wonderland (1921). Nowadays, dinosaurs could probably function as gateways to Carroll’s books as much as Carroll’s tales work as hooks into palaeontology. Of course, for the cultural historian convinced that there remains something interesting to say about dinosaurs, but who is simultaneously trying to shrug off the albatross of Jurassic Park, the moments of relative indifference to dinosaurs are as telling as the moments of enthusiasm. What I’ve talked about here certainly aren’t uncharted territories in terms of academic study. Nonetheless, they are uneven ground. I suspect there’s still more to learn from the media of popular palaeontology between the 1870s and the 1920s, when ‘dinosaur’ (just about) became a household word, and especially from media consumed by or addressed to children. There is also, surely, more subtlety to add to what Wikipedia calls the era of ‘moribund dinosaurs’ (the 1930s to the 1970s). The cultural construction of the dinosaur from the 1870s to the 1970s encompassed changing ideologies of evolution, new forms for the communication of science in the mass media (including cinema), the shaping of national identities, and many other evocative issues. Recreating this dinosaur will require a few more trips through the looking-glass. Following on from the event in September 2016, we are pleased to announce that we will be holding a second workshop in December 2017 (talks and blogposts from the last workshop can be found here: www.poppalaeo.com). The aim, as with the last event, is to encourage dialogue between palaeontologists, science communicators, artists, museum professionals, and social sciences and humanities academics, and discuss the public role of the deep-time sciences in current society and historically. The workshop will also feature a pop-up exhibition of palaeoart on the evening of Wednesday 13th December at the KCL Strand Campus (more details to follow). Current attendees include: Paul Brinkman, Steve Brusatte, Mark Carnall, Vicky Coules, Richard Fallon, Melanie Keene, Darren Naish, Bob Nicholls, Ilja Nieuwland, Paige Madison, Beth Windle and Mark Witton. If you are interested in attending or participating please get in touch withchris.manias AT kcl.ac.uk. The workshop does have fairly strict limits on numbers, owing to space and funds: if we can’t fit you into this event, we will certainly keep you posted about future events and activities. The talks will also be recorded and uploaded to the workshop website. When I asked “what am I doing here?” at the start of my PopPalaeo presentation, it was a rhetorical question – or it was supposed to be. Later, when one of the other delegates took me aside and asked (not, I think, maliciously) if there had even been a hypothesis in my paper, I began to wonder all over again. It is both a privilege and a curse of study in the humanities that questions of purpose continue, time and again, to present themselves. I’m a literary critic. I write about and teach popular fiction, but I’m especially interested in thinking through the ways in which our culture narrativises science (and vice versa). The complex interactions crudely articulated by the ‘Two Culture’ model are, in a way, themselves my subject. Whilst working on my last book, which was about the relationship between science and fiction in the pages of 1890s magazines, I slowly realised that dinosaurs were the ideal way into the research questions I wanted to answer: enormously and persistently popular, they are impossible without both highly rigorous science and a decidedly artistic imagination. They are also – and I hope that the palaeontologists reading will not grimace too much at this – extremely human things, and to tell their story is also, as any museum display will confirm, inevitably to tell the story of how it has come to be told. I suppose I mean by this that dinosaurs are interdisciplinary. Thinking about them necessarily entangles not only a spectrum of scientific pursuits but a broad range of cultural and artistic ones, and the list only grows if we consider the history (itself, of course, a disciplinary concern) of how they have been imagined. Geology, sculpture, evolutionary biology, museum studies, archaeology, architecture, information technology, comparative anatomy, fine art, climatology – these are only the broad strokes. For somebody whose intellectual project is the scrutiny of the Two Cultures model, this subject is a gift: no reasonable approach to the idea of ‘Popular Palaeontology’ allows us to leave separate domains of scholarship which have, historically, been separated. To study the popular, though, is not to become it. My publisher is keenly aware of this, which is why my book costs £64.99. By the same token, to study disciplines – the ways we in which we relate knowledge, in every sense of the word ‘relate’ – is not to become interdisciplinary. To imply that I could, in time I have spare from teaching Victorian novels, develop an expert knowledge of vertebrate palaeontology would be the deepest insult to both fields, as if nothing worthwhile proceeds from the former (I worked hard to develop an understanding of Victorian literature and I don’t regret it) and as if the latter can be compassed without a lifetime of study and dedication. ‘Interdisciplinarity’ is a fraught concept anyway, and I’m far from convinced that achieving it is either possible or desirable, however much universities like to say the word. We all have our competencies and need to be proud of them. It’s thinking like this which has turned me into an enthusiastic proponent of multidisciplinarity. A room full of people with the breadth of experience to take on something as complex and multimodal as ‘the dinosaur’ effectively, meeting on common ground with as little prejudice as possible, has the potential to provide insights into much more than Mesozoic life. With such a rich subject, and such a rich range of approaches to it, we can begin critically to think about how our culture processes knowledge of all kinds – and about how the politics of disciplinary division shape the ways in which we think, teach, and understand the world. I think we began to see a hint of what this might look like in the final discussion session at PopPalaeo, and it’s the reason I’m excited for whatever happens next. I lack the army of competencies and character virtues which would make me a Shaena Montanari or a Darren Naish, but if there is indeed to be a multidisciplinary table discussion about palaeontology and popular culture then it could be useful to have along for the ride somebody who is thinking about the table itself. My presentation at the workshop, titled The Other 97%: Making the most of the underwhelming fossils in museums (video here) was a tongue-firmly-in-cheek examination of some of the difficulties of popularising palaeontology, especially in museums but also further afield. As Mark Witton has already touched on in his blog post and as evidenced by a number of (excellent) talks during the Popularising Palaeontology workshop, popularising palaeontology is almost always synonymous with talking about dinosaurs. Occasionally, mammoths will sneak in there and every now and then there’s a focus on human evolution but from paleontological exhibitions, permanent museum displays, young adult popular science books and palaeontology in the mainstream press there’s a disproportionate focus on dinosaurs. With the explosion of social media and many palaeontologists writing their own blogs there’s more accessible paleontological content out there than ever before, however, when it comes to the wider public, museums still remain as the places where most people come face to face with palaeontology and as evidenced by the queues for the dinosaur gallery at the Natural History Museum London during the holidays and from the photos from museum visitors on social media, dinosaurs remain a firm favourite. In fact, in museums dinosaurs are synonymous with the whole of natural history- the ‘one with the dinosaurs in it’ is a common way to differentiate between the different museums in South Kensington (and at Oxford University museums). However, a focus on dinosaurs in museums is problematic for a number of reasons. Firstly, for museums wanting to educate but also needing to attract visitors, dinosaurs are somewhat expected and more likely to draw the crowds. There’s a reason that the Natural History Museum London’s touring exhibitions are so dinosaur centric (four out of ten at the time of writing). Are some museums trapped into popularising dinosaurs? Secondly, most museums lack the resources to keep their displays and exhibitions up to date with current dinosaur palaeontology. This was highlighted recently with the release of Jurassic World as vertebrate palaeontologists took to social media to point out the myriad of scientific inaccuracies in the blockbuster film, many of our natural history museums still have displays and artwork woefully out of date or inaccurate. It’s no wonder that so much of the reaction to popularising palaeontology is correcting inaccurate preconceptions (non-feathered dinosaurs, tail dragging, dinosaurs as birds) when many of the star attractions in museums are 19th Century articulated casts and skeletons in need of an expensive rearticulation or reinterpretation. Lastly, and the thrust of my presentation is that, obviously, non-avian dinosaurs are just one part of palaeontology; taxonomically, temporally and professionally. When it comes to the physical material held by museums, it’s also a tiny percentage of the paleontological material held. Other large fossil vertebrates can be just as awe-inspiring as the models, casts and skeletons of dinosaurs yet don’t tend to have entire galleries dedicated to them. Where invertebrate palaeontological displays exist they tend to be either arranged taxonomically or chronologically, with the best looking of a representative sample labelled little more than a scientific name and horizon. What I would like to see is an injection of creativity and diversity around ‘the rest’ of palaeontology when it comes to museum display sand exhibitions to make more use of the 97% of collections and to try to break away from re-treading the tropes of dinosaur palaeontology on display. We have already developed a lot of these tools for supplementing museum material and making engaging exhibitions and displays that can be turned to popularising the rest of palaeontology:- virtual reality, animatronics, models, 3D reconstructions and cinematics. Imagine walking into a palaeontological gallery to be faced with the large crushing jaws of Cameroceras or a herd of ‘taxidermy’ Synthetoceras next to original fossils and casts. Imagine a line-up of Leedsichthyis, Andrewsarchus, Shonisaurus and Prionosuchus next to the usual sauropods and cetaceans. Imagine dioramas of Tanystropheus, Helicoprion and Arthropleura. Of course, these examples are just the bombastic end of the diversity we find in the palaentological record- the biggest, weirdest and err wonderfullest for starters. I’d also like to see a diversity in modes of interpreting fossils in museums. Outside of dinosaur displays, taxonomy and chronology are still dominant modes of display that can be traced back to 19th Century arrangements of specimens, parodying the ‘comprehensive displays’ that would only be visited by learned gentlemen. How about displays on soft tissue anatomy, ecosystems, lansdcapes convergent evolution? I can imagine exhibitions called Butts, Flightless and When Continents Collide which would be unlike anything we’ve seen so far. Or alternatively, letting go a bit of dry interpretation and rigid adherence to evidence with content around speculative palaeontology (All Yesterdays: the exhibition) or embracing humour and popular culture as in my attempt to popularise the other 97% with the blog series underwhelming fossil fish of the month, making interest out of the fact that some species of extinct organisms will never be interesting to most people (or even palaeontologists). Of course, this isn’t completely unexplored territory, many natural history museums are already experimenting with new modes of popularising palaeontology. The Royal Belgian Institute of Natural Sciences had a display of theoreticaldescendant animals; including ‘taxidermy’ specimens of the tapir-like rodent Cortichaeris gouldi, marsupial Trichopteryx dixoni and a model of arthropod Helicopodus biryani. At the Oxford University Museum of Natural History, models of theoretical ancestors concestor and shrewdinger are the focus of touchable displays on evolution (naming shrewdinger itself was an exercise in popularising palaeontology by the American Museum of Natural History). Figure 2: Speculative palaeontology from the future with Cortichaeris gouldi and the past with Concestor and Shrewdinger. With a nice Diictodon model thrown in for good measure. Images courtesy of the respective institutions. This is not to say that dinosaurs should be blacklisted as gateways into an interest or inspiration into natural history but with today’s technology and modes of communication, there’s an opportunity to break the mould of what has been a long dominant way of popularising palaeontology through displays and exhibitions. Arguably, its static museum displays and the tropes of interpretation which perpetuate those unshakable misconceptions we all have to work so hard at addressing before we can engage with ‘new content’. Reinforcing long outdated ideas and underselling the broader picture of what makes palaeontology such an interesting area beyond what one group was up to in the Mesozoic. In the preface to the second edition of his Extinct Monsters (1892), Henry Neville Hutchinson wrote to thank readers for ‘the kind way’ they had received his ‘endeavour to popularise the results of modern Palæontology’. ‘There seem to be fashions in all things—even in sciences’, he continued, adding that ‘wonderful advances’ in physics and biology ‘may have tended to throw Palæontology somewhat into the shade. Let us hope that it will not remain there long’. Yet, considering that it was preceded by the infamous, litigious, and bountiful Bone Wars, and shortly followed by the hunt for gigantic sauropod dinosaurs that Paul D. Brinkman calls the Second Jurassic Dinosaur Rush, Extinct Monsters was hardly a shot in the dark. However seriously we take the popular writer’s self-promoting preface, palaeontology has rarely been cast into the shade by historians of science. We’ve seen a tremendous deal of great work on the field’s eighteenth- and nineteenth-century pioneers, especially in Britain and France. Now, as Chris Manias noted at the beginning of this excellent and productive workshop, many scholars are working on continuing where the narratives of figures like Georges Cuvier, Mary Anning, Charles Lyell, and Richard Owen leave off, through their late-nineteenth-century successors and into the very different landscape of the twentieth century. At Popularising Palaeontology, Germany and the United States took the historical spotlight. Funding, institutional politics, and the strategic machinations of palaeontologists in the brave new twentieth-century world were the order of the day. Unlike most of the subjects of these papers, Hutchinson wasn’t a professional or institutional palaeontologist. He published very few scientific papers in specialist periodicals. Rather, his main claim to palaeontological authority was his secondary research—wide-ranging, synthetic, and often based on personal relationships with leading palaeontologists and geologists. His other claim was that people actually read his work. Or, if nothing else, they looked at the pictures. Back in 1892, thanks primarily to the work of O. C. Marsh, complete skeletal reconstructions of dinosaurs were, for the first time, available to artists. Hutchinson hired Joseph Smit, a highly-accomplished zoological chromolithographer, to provide Extinct Monsters with restorations, or palaeoart, that captured this new vision of dinosaurs as lithe, heterogeneous, and often bipedal animals. These were far removed from the lumbering reptilian beasts depicted earlier in the century, which were based on ingenious extrapolation from much more limited fossil material. Hutchinson’s book proudly paired woodcuts of skeletal reconstructions with Smit’s sensational restorations, showing the reader that these were not fanciful pictures but cutting-edge contributions to scientific thought, and endorsed by none other than the London Natural History Museum’s Keeper of Geology, Henry Woodward. In the text, Hutchinson honestly explained to readers the difficulties of this search for some form of palaeoartistic fidelity. The book was a great success: it popularised palaeontology. Over the course of this workshop, Darren Naish, Mark Witton, and John Conway all discussed the power of art in expressing contemporary palaeontological ideas. Exciting images of extinct animals proliferate rapidly as memes—copied, plagiarised, altered. The same was true in Hutchinson’s day. Smit’s designs, lifted from Extinct Monsters and its sequels, reappeared in cartoons, newspapers, and novels in the following decades, removed from the cautious and didactic context of the popular science book. The memetic status of a palaeoart image doesn’t necessarily correspond to whether or not its artist was scrupulously working with the fossil material at hand, or critically consulting the most current research. An attractive but scientifically baseless restoration can, therefore, find itself duplicated in new and unrelated contexts. In addition, a particularly compelling and enduring restoration inspired by contemporary palaeontology, like the iconic Velociraptor of Jurassic Park (1993), can fire interest in new visions of prehistoric species, but then later to obstruct efforts to interest publics in more recent developments. In the world of palaeoart, quality control (a controverted concept in itself) is largely self-enforcing, and is therefore often not enforced. What level of responsibility do popularisers and artists have for their work? Hutchinson certainly possessed a keen sense of responsibility. He felt that access to science was being shut away from borderline figures like himself, and that, for the public, the situation was even worse. Experts in the field, according to Hutchinson, wrote only ‘“dry-as-dust descriptions” and ponderous reports’ with no hope of attracting wider audiences brought up on thrilling modern novels. In the 1910 edition of Extinct Monsters, he promised to deal with his material ‘in a light and superficial way’. It was, after all, only ‘the cream that the general public require’, rather than the ‘reservoir of milk below’. Many of the specialists whose works Hutchinson translated to more palatable prose found his tone somewhat impertinent. What gave him the right to take such a high tone? After all, he was simply a populariser. It goes without saying that nobody in attendance at Popularising Palaeontology would have been comfortable with the idea of someone being ‘simply a populariser’. When Hutchinson died in 1927, his Geological Society obituary noted that he was ‘known, at least by name, to a far wider circle than that which most of us can reach’. If you read about palaeontology in English in the 1890s, 1900s, or 1910s, then the chances were high that you were learning from Hutchinson. His books lurked on library and drawing-room bookshelves for decades after—increasingly outdated in their science, but, like Jurassic Park, no less appealing for the passage of time. The diffusion concept of popularisation, where scientific facts are directly but slowly passed down to the unquestioning public, has long since gone extinct in academia. As Ian Malcom says to John Hammond: “the kind of control you’re attempting is…it’s simply not possible”. Understanding how popularisation works is essential to the history of science, and if contemporary popularisers of palaeontology are going to persuade their various publics that Velociraptor had feathers, then they, too, might have to dust off Hutchinson’s Extinct Monsters. You can’t say half of what you want to say in a public talk. Whether it’s at a huge international conference or among a small cosy research group, whether enthusing children or sharing your subject with keen-minded adults, there is always so much more to share than can ever fit into your allotted time. There are a few approaches to this problem. Some speakers can’t bring themselves to part with a single slide. They get three-quarters of the way through their talk, then tear through the unwieldy number of slides still remaining while the session Chair stands behind them, tapping their wristwatch and impatiently clearing their throat. Another approach is to cram oodles of information onto each slide, hoping that even if you can’t say everything, the audience can at least see your copious thoughts, packed between the dense text and brain-boggling array of images. For the rest of us, we admit defeat. You just can’t say everything you want. Embrace the burn: pick out the very best slides to illustrate the main themes, and then have a stiff drink to lament the creativity and knowledge you have no time to share. You can even allude to these “lost slides” during the presentation, or perhaps invite your audience to ask you about them afterwards. I’d like to share with you my forgotten slides from Popularising Palaeontology: Historical & Current Perspectives. The title slide from my talk at the workshop. But as with all presentations, some of the slides never made it to the final version. My omitted slides involve a talking platypus. I know what you’re thinking: how on earth could such a thing not be of utmost importance for any talk, whatever the subject? In this case, despite it being my favourite part of the research I did for my presentation on the challenges of popularising mammals from the time of dinosaurs, these slides didn’t contribute enough towards the main narrative of the presentation. While doing research, I was exploring the appearance of early mammals in the public consciousness. These creatures - scientifically perhaps the most important fossils to come from Mesozoic rocks - have long been overshadowed by the giant reptiles they lived alongside. I went spelunking for popular references to Mesozoic mammals in art and literature, and in doing so came across the wonderful, Dot and the Kangaroo. Frank P. Mahony’s lovely illustration of a scene from Dot and the kangaroo (1899). In this Australian children’s book, written by Ethel C. Pedley and published in 1899, a little girl named Dot wanders into the outback near her home, and gets lost. As children are wont to do in fiction, she befriends an animal: a kangaroo who has lost her joey. The kangaroo agrees to help Dot find her way home, and suggests they consult the platypus, who has been around so long it knows everything. The platypus, according to the highly strung creature in Pedley’s tale, existed “millions of years before the ignorant Humans”. While the same can be said of a great many animal lineages on earth, what Pedley is specifically referring to is a hangover from early Victorian misunderstandings about mammal evolution. The first scientists to encounter mammals from the time of dinosaurs misidentified them as marsupials (animals with pouches, such as the kangaroo) and monotremes (the platypus and echidna). They considered life to have “progressed” up a ladder; with humankind wobbling on a throne at the top. In early evolutionary scientific models, mammals began as primitive egg-laying monotremes, then stepped up a rung to become marsupial, before reaching the perfection of the placental (giving birth to live young). This led to depictions of Mesozoic platypuses being gobbled by crocodiles beside fern-lined swamps. The true course of evolution is more beautifully complex than this. Monotremes, marsupials and placentals all share an ancestor. These lineages have lived alongside one another for millions of years, rather than evolving from one another along some anthropogenically judged scale of “primitive” to “advanced”. While platypuses and echidnas share many characteristics with our Mesozoic ancestors (which provides clues to ancient mammal biology) they are as advanced along their own path of evolution to the present day, as we are along ours. From H.R. Knipe’s Nebula to Man (1905). A depiction of Mesozoic platypuses being eaten by crocodiles. While science moved on from this misunderstanding before the end of the 1800s, the misconception of monotremes somehow belonging to the time of dinosaurs and being more ancient than placental mammals, remained alive and well in popular culture for decades (arguably, vestiges of it still remain). The platypus in Pedley’s story rants at Dot about its multi-million year origins; “I can prove by a bone in my body that my ancestors were the Amphitherium, the Amphilestes, the Phascolotherium, and the Stereognathus!" This speech stunned me. Where did Pedley dig up these names for creatures relatively unknown to the public? How amazing to see them in a child’s story, when our current culture is hell-bent on over-simplification for fears of frightening the villagers with fancy science-talk. As palaeontologists know well, children are not afraid of scientific nomenclature (though many adults are). Pedley lifted her monotreme’s ancestry from Charles Lyell’s Elements of Geology (1841). How wonderful to think that a generation of Australian kids might be familiar with the obscure early mammals I’m endeavouring to popularise over 100 years later. By the 1970s, the feature-length animated adaptation of Dot and Kangaroo had already begun to whittle the number of names: “…my ancestors were the famous Amphitherium, the illustrious Phascolotherium, and the renowned Stereognathus!" It is maliciously delicious to hear the voice-actor strain over pronouncing these unfamiliar beasts. I screen captured the platypus scene from the film for my slides, but admitted to myself later that including the story of Dot and the Kangaroo was an indulgence on my part. It excited me to hear the beautiful little mammals I study mentioned in literature and blurted out in a cartoon. However, the clip ate a large chunk of presentation time, without adding a great deal to my point. While I shed it for the workshop, I can share this delightful morsel of Mesozoic mammal cultural history with you here. I hope it tickles you, as it did me.